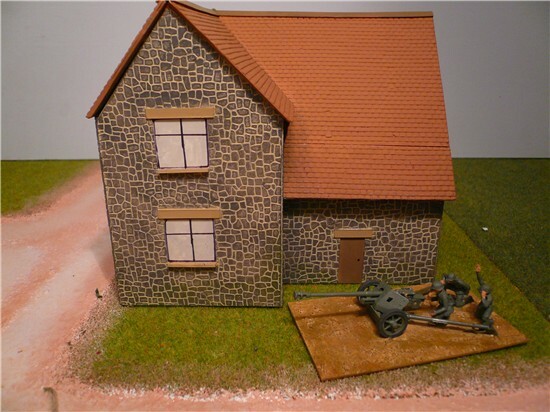 Whichever period of history you are recreating on your wargames table, decent scenery adds so much to the pleasure of your game. These days, there is much to choose from, produced by a number of manufacturers and most commanding reasonable prices. 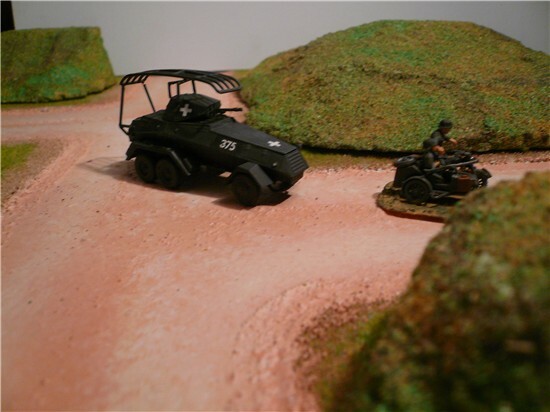 But if, like me, you are a modeller as well as a gamer, making your own can be fun and rewarding. 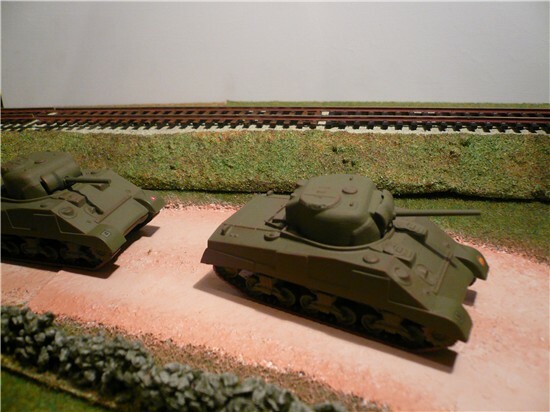 Unfortunately there are very few articles in wargame magazines showing you how to do this but I would recommend the Hornby magazine - intended primarily for railway modellers - but always full of brilliant hints and tips for making scenery and using proprietary items. 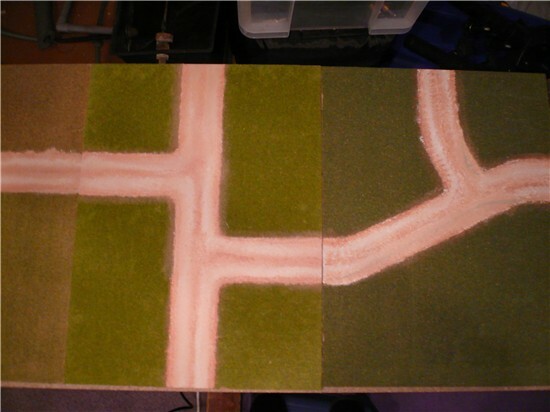 I use a system of 6mm MDF boards cut to either 24” x 12” or 24” x 18”. 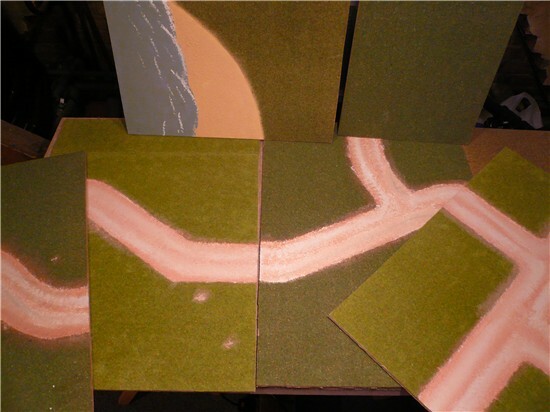 These are covered by proprietary “flock paper” that comes on a roll – Heki I think make it – and have a pattern of roads leaving the boards at various points in such a way that the boards can fit together in a number of ways. 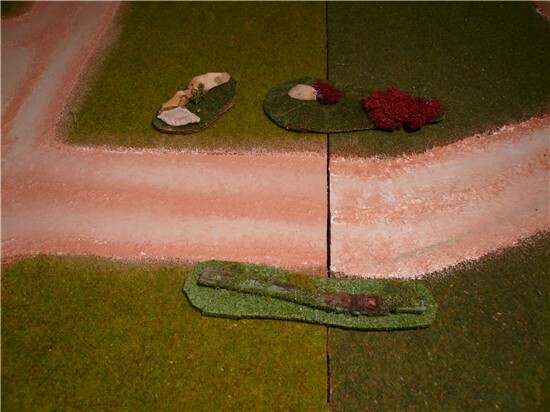 There are also plain green boards, some with a river (see the photos of the game with the Airfix bridge), and some sea/beach combinations . The road system includes some straight sections, junctions and curves. The boards are reversible and a different pattern is created on the reverse. Whilst this reduces the ability to have contours as part of the board itself, it means that I can create millions of baseboard combinations with only 25 or 30 actual boards. 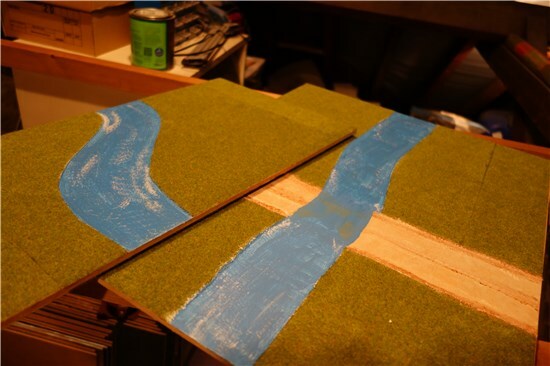 Below; new scenery boards for 2016 featuring river sections. These are set out on the boards in the same way as the roads so that lots of variations can be achieved by just a few boards. Walls are made from Plastikard bases and small stones intended for use in fish tanks. A bead of Unibond NoMoreNails is run along the card base and the stones pressed into it. When dry, repeat this process and use a third layer to create a top. As you can see, broken down walls are easy to make as well. The finished article looks like the wall at the back. Paint dark green all over and then dry-brush light grey before adding scenic flock material to the base using PVA glue. Wall sections of different length are produced along with corners and gapped sections. Although not shown here, I also have some with trees and large bushes integrated into the base. The walls can also be made directly onto the base of a building to create a perimeter - perhaps for a rustic farm building. As an alternative, use plastic walling. 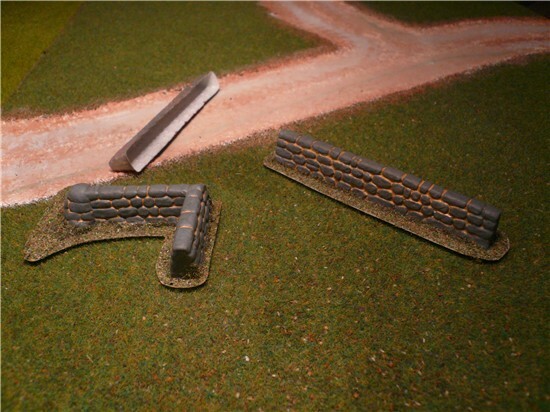 (See photo l-r) (i) two sections cut and fixed to make a corner, (ii) the walling comes unpainted and is simply a “blown” plastic shape and (iii) the section cut out with some of the base still attached. Paint mortar colour all over and dry-brush with stone grey. Flock the base again to match the boards. 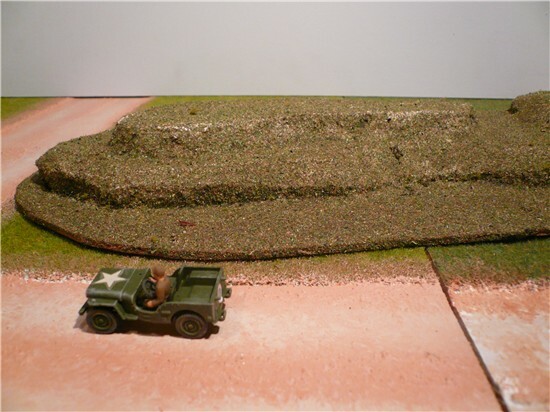 Ground cover is easily fabricated from various stones, twigs and lichen pieces set onto a base of cork sheet. The cork is either covered with “flock paper” to match the board or flock material as per the walls above. The lower picture reveals the underside to show construction details. I have about a dozen of these pieces ranging from the small stone pile (top left in the upper picture) to those about 4 inches square and including trees. I have used twigs and stones from the garden plus one cork tile and some flock material - total cost is easily under £1 – not bad value and fun to make as well!! 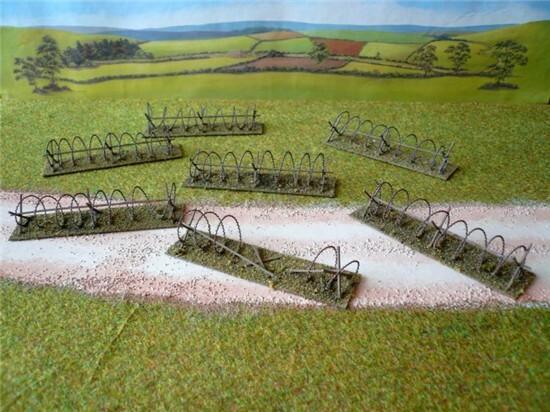 Some years ago I bought a couple of packets of 20mm barbed wire as this is a battlefield essential. The photos above show the result of a couple of hours work. The base is 40 thou Plastikard cut into 4 inch sections (and the width of my ruler!) and the wooden battens are 40thou x 40thou plastic strip pieces each 25mm long. The wire is then wrapped around a felt-tipped pen to make the shape before fixing to the battens/base with Superglue. The wire is painted Humbrol 53 (gunmetal) and the battens Humbrol 110 (wood) - both acrylic. The wire is then dry-brushed with Humbrol rust and the base flocked in my usual manner. One section (see lower photo above) was made to look as if it had been breached by a vehicle. In the game, once cut, this section could simply be removed. 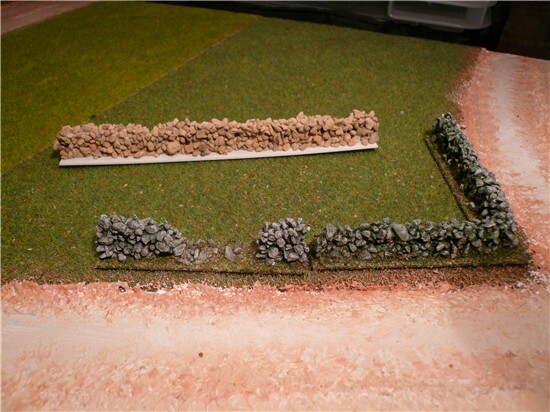 These last two pictures show a simple version of the trenches that I use. Make sure that the holes are bit enough to fit your figures (I had to change these ones having forgot to check!!). Any flat pieces of polystyrene can be used as long as they are not more than about 1cm thick (for 20mm figures). The more complex pieces are cut into trench systems for mortar/artillery pits or command posts. There are plenty of good pictures in the Osprey books showing these types of defences so copy from there rather than make up your own designs. A very cheap packet of “fir” trees set into flocked cork tile bases makes a Scandinavian wood scene. The trees are grouped into twos and threes as well as based singularly. The 20mm quad AA gun is from Italeri. 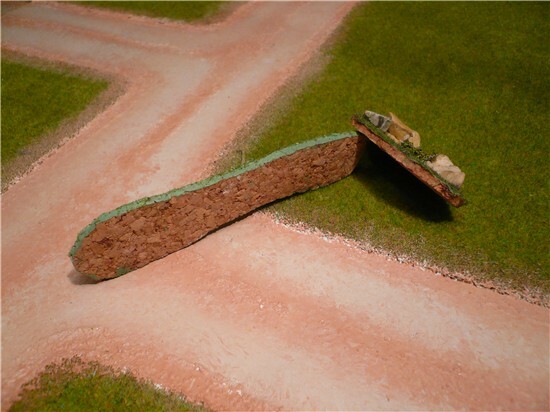 Over time, the cork bases can curl as shown here – painting the bottom with PVA avoids this. 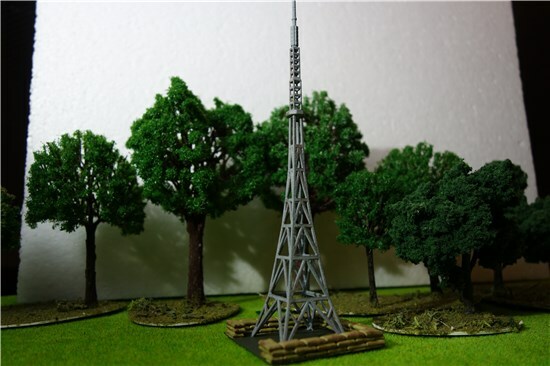 There are some excellent tree kits on the market for the model railway market - Woodland Scenics range is particularly good - or you can make your own using twisted wire and Woodlands flock material. A WORD OF WARNING however, I have found these to be really nice models but lacking the robustness to withstand wargaming. 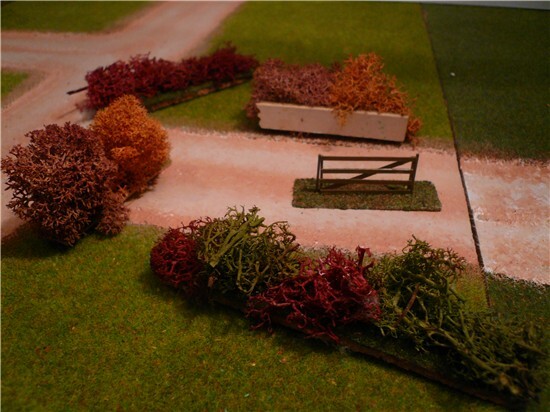 They are designed to be planted on a model railway layout and left alone, not put out and packed away every week. 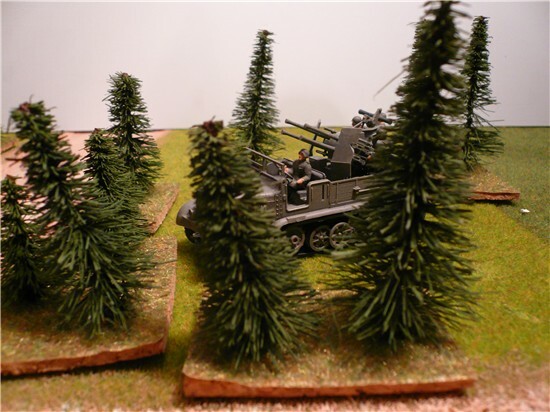 Try your local model shop or eBay for packets of cheap trees that can be sprayed with varnish/hairspray. 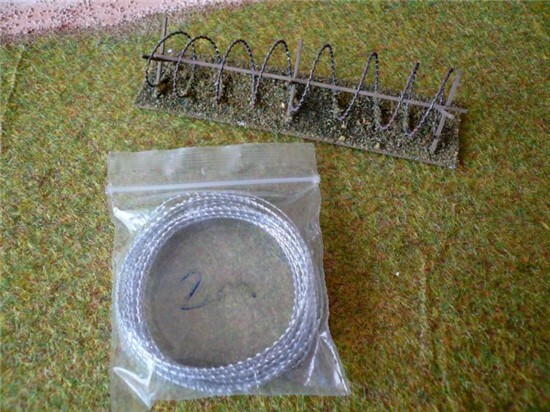 The photo on the left shows how lichen is based onto card to create hedges and a model gate is suitably mounted on card. 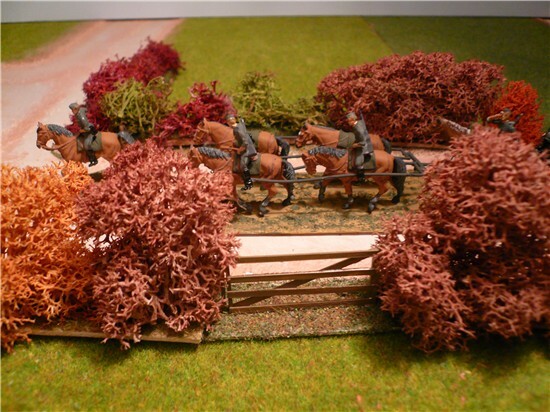 On the right, these elements are combined to form a hedge-lined country lane down which German horse-drawn artillery advances (Horses and artillery from HAT). The gate is made from strips of plastic card painted brown. If you have not worked with plastic card before, try making a gate as your first product. Plastic strip can be bought or cut from sheet material. .003 ("30 thou") is a good universal thickness to work with. It is glued together using Slaters MekPak or Plastiweld or similar products (ask your model shop). This actually welds the pieces together by slightly melting the two surfaces that need to be joined resulting in a tough but invisible bond. It can be painted using either enamel or acrylic paints. As a railway modeller, you would be disappointed not to see some railway track somewhere!! 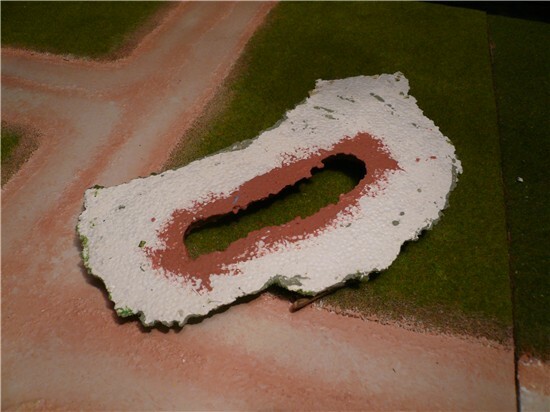 This is ordinary Hornby track, weathered with rust coloured Humbrol paint and laid on top of a low embankment made from polystyrene. 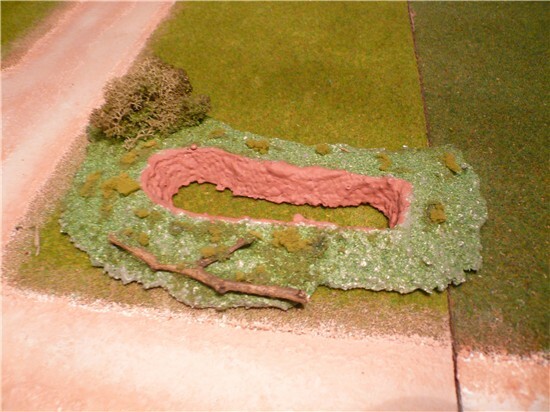 The track can easily be laid straight onto the ground of course, but do include a strip of "ballast" under the sleepers - made from a grey textured paper or the foam strip sold by Hornby to represent the ballast on a model railway layout. Polystyrene gives the ability to raise and lower the height of the embankment so that culverts and under-bridges can be included. 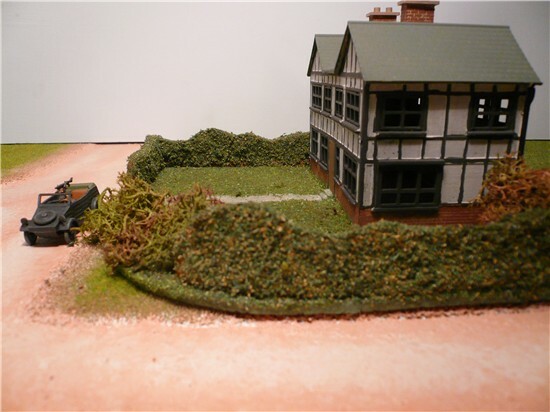 A few turnouts (points) can be used to create a shunting yard and there are plenty of very cheap plastic wagon kits around (Airfix or Parkside Dundas for a start) allowing you to set up a British or European scene. The Shermans here are from the Armorfast range and once painted/weathered, they look very good (if basic)! Buildings can be based and given suitable adornments. 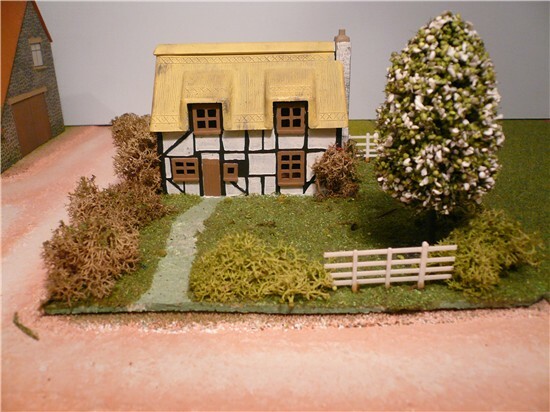 Here an old Airfix/Dapol English cottage (intended to be used for my Defence of the South Coast campaign) has a garden that includes a tree and hedges. Below is a farmhouse built from plans appearing in the Railway Modeller magazine many years ago - it has Somerset origins I understand. With a pantile roof, it becomes somewhat generic and certainly has been used in various games in various countries!! The windows are simply painted on rather than the usual deep-framed version I would use on the railway layout. 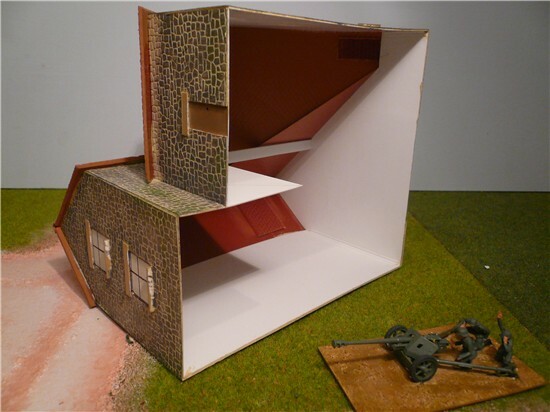 This building has no base and so can stand alone in a field or surrounded by hedge sections. (below) No, not the result of an artillery attack!! The underside of the farm house shows the simple Plastikard contruction and the fact that I forgot to paint the undersides of the window cills.